Upon meeting Keith Nelson, anyone prone to superficial first impressions might have difficulty believing he's dedicated to helping save the environment. Tattoo-covered arms and a predilection for Harley Davidson motorcycles aren't usual indicators of green-minded individuals. However, this has not kept Nelson, manager of family-run Nelson's Auto Service in Hailey, from trying to help auto mechanics around the world become conscious of the effects they have on the Earth. Nelson, whose shop specializes in oil changes, is concerned about the amount of oil being dumped into landfills from discarded oil filters, and the resulting contamination of soil and groundwater. He's spent the past nine years trying to find a solution. The problem is the amount of oil remaining in a used filter after it is exchanged for a new one. Despite a law mandating that used filters be left to drain for 24 hours after removal, the advent of a check valve in the filters during the late 1980s meant they remain about half full when thrown into the trash. Many states require shops to have some sort of device for drainage, such as crushers or cutters to open the can, but, Nelson said, those are inconvenient and often too time consuming for the average service shop. Standing in the confined concrete pit of his garage, where the bulk of his work takes place, Nelson gave a demonstration of an existing cutting system. While the job takes only a few minutes to complete, it's easy to see from the number of old oil filters stacked up that it would not be an enjoyable task at the end of a long day. Having provided professional oil changes for 25 years, Nelson knew that step often disappears between the removal of a filter and its arrival at the dump. "There's something wrong here and we have to do something about it," he said. Searching for a simpler, less time-intensive tool, Nelson worked on a number of different prototypes, eventually arriving at his final design. "It's perfect for the brain-dead mechanic," he said with a grin. When most people think of environmentally friendly inventions, solar panels and exhaust-free engines spring to mind, not an 8-inch piece of metal with two small spikes attached. That could change, however, if Nelson finalizes a deal with international tool manufacturer Ingersoll Rand. Set to meet with the president of Ingersoll's production systems next month, Nelson is hoping a partnership will lead to worldwide awareness of the difference his tool can make for the environment. Nelson gave this reporter a demonstration of what that difference could be. 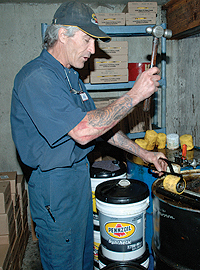 Setting a used oil filter on a set of connected parallel bars, he used the hook at the top of his tool to align the spiked underside with the center of the metal canister. Holding the assembly steady with one hand, he used the other to sharply rap the flat portion of the tool with a hammer, driving the two small spikes through the filter's casing. Nelson then placed the oil filter on the upper rim of a 50-gallon oil drum with the two small puncture holes, one for drainage and the other for air, angled down toward the center of the barrel. Within seconds, a steady stream of oil poured from the bottom hole. He waited five minutes and then sliced open one end of the canister. Removing the actual filter proved the effectiveness of this simple method—mere dabs of oil remained on the surface of the metal. "Since we started using this system, we've been collecting somewhere between 30 and 60 gallons of oil per month," Nelson said, visibly excited. "And this is just at Nelson's (Auto Service). Imagine if it was being used in Dallas or Chicago, rather than only Hailey." With the help of Hailey-based Byron's Welding, Nelson has produced approximately 20 of his patent-pending oil filter drain systems and sold them to nearly a dozen automotive service shops in the Wood River Valley, as well as in Twin Falls and Shoshone. The new users are coming to understand the implications of Nelson's invention. "After using it, I was disgusted to know how much oil we were throwing away," said Justin Krien, a mechanic in the service department of Sawtooth Auto Sales in Hailey. "It used to take us an entire year to fill a single five-gallon bucket. Now it takes less than two weeks." Nelson hopes mechanics worldwide, as well as environmental agencies such as the Environmental Protection Agency, will have the same revelation as Krien. "It's a simple solution, but it's going to make a difference," he said. "And it's not for us, but our future generations." For more information, Nelson can be contacted at 481-1742.